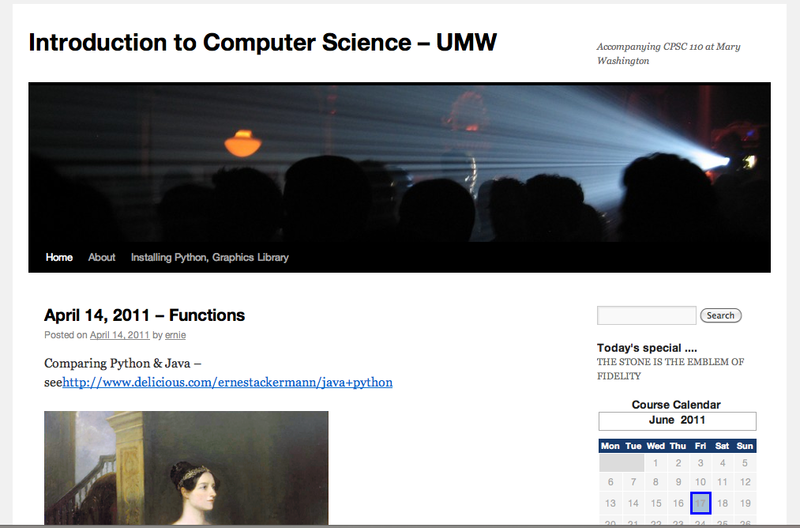 Here’s another sample site, this time for a computer science course at Mary Washington. The site is simple, with the information flow more or less exclusively from professor to student. It’s also a little difficult to negotiate retroactively (assignments, for example, aren’t found in a easily discerned single place). The result is a strong case for organizing a site using categories as you go, but was probably useful for student and professor as the class was in session. The main reason I’m posting it, however, is for those of you who’ve been talking to me about homework and quiz options might find this post particularly useful. The professor has set up a form that will email him the answers to the questions once the students answer. He also uses a more traditional format, having students download an ms word homework assignment which they then email to him. The advantages to this are of course a lack of paper, etc. Ideally, though, one would probably want a solution that doesn’t involve email, but rather stays on the course site, don’t you think? Below you’ll find two sites which were used for the same class, a Macaulay Honors College Class called ‘The Peopling of New York City’. Both sites use a platform very similar to what you’ll be using in the fall. I like these largely because they’re relatively simple–while often we benefit from students who can do amazing things with our sites, this is a relatively standard set up that (I promise) any of you will be able to do by the end of the Fall 2011 term. One thing I do want to remind you of (and I’m sure I’ll be saying this again), don’t be intimidated by sites like this–we’re looking at what took an entire term to build, and each of these started as bare bones sites, with just a syllabus and a not much more. To the sites then. The first is the class’ main site, which I imagine most of you will imitate to some degree. Here we have a syllabus, resources, a page where students post short writing responses, and guidelines on larger projects (the equivalent of a handout). Much of what’s here is going from professor to student, except the student responses. Click the image to be taken to site itself, and have a look around. Below, then, you’ll see the second class site, which is the student-directed research project. This is nicely done, and most pages are within most student capabilities (maybe with a little help from your community facilitator)*. It’s a nice project, with video, a pleasant look, and a rigor that I think the students can be proud of. You can click this image to have a look as well. *if you’re curious, this page is one students will be able to do with just a little training. This one is a bit trickier. You can see that even on this system there are presently 139 (!) plug-ins you might use. Pretty overwhelming, especially given that you might have to page through all those pages to find what you’re looking for (there is a search function, so do use that–but wordpress developers like to give things funny names). 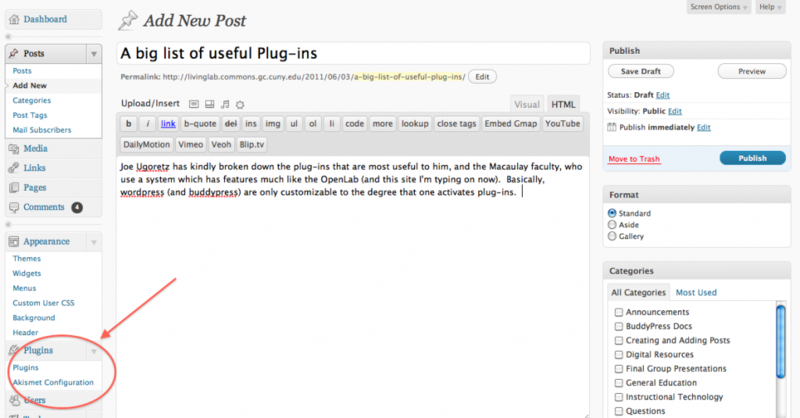 Add to that this: Around the world, wordpress developers have created (as I type) 14,682 plug-ins! Anything we can find that helps us break off pieces that are more useful for our pedagogical purposes, then, helps. You can find Joe Ugoretz’ whole post here on the commons. Scan about halfway down and you’ll see it. It’s a very valuable summation. More importantly, let us know if any of these are features you think will be useful for you next term! We’ll certainly do our level best to accomodate any requests. We’ve updated a few more things on the site! But do keep sending me suggestions and comments, in particular those things that we’ll be able to roll-over onto your own sites later in the summer. A fine example of this comes from Karen, who was hoping for a way to embed a calendar into her site in the fall. At present I’ve activated a calendar plug-in for our site (you can see it under ‘upcoming events’ to the right), which is synched with a google calendar dedicated to our activities. The calendar can appear as its own page or on the sidebar. At present I don’t thing there’s a way to make it appear as a grid, but notice that clicking on an event can lead to a map and directions! As always I’m happy to show anyone how to set it up, and we’ll be sure to cover it in our Summer Workshops. Also, if any of you want to add anything to our calendar I’m happy to add you as an author. 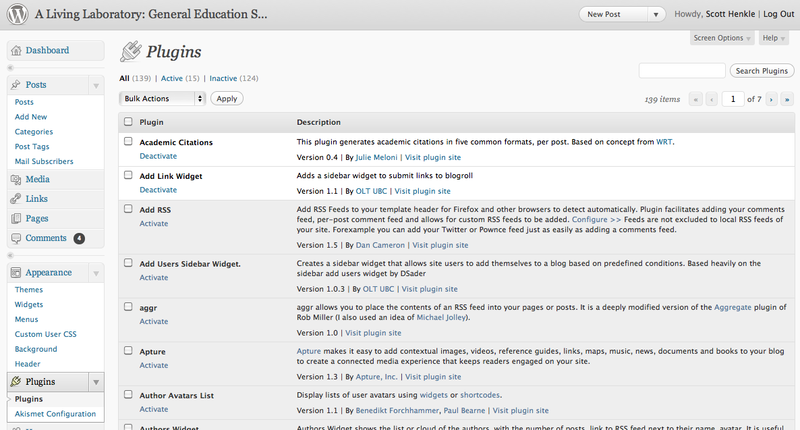 Also notice the updated tutorials section, which builds on our custom menu to create a subpage for each tutorial, a set up that should help you find what you’re looking for and which should help your students find what they’re looking for (when you’re thinking of structuring your own sites). Do let me know if there are any tutorials you think we should add to that list. If you’re anything like me, repeatedly returns to video tutorials are the only solution for a terrible memory. Lastly, under ‘technology and pedagogy’ you’ll see some new articles and essays which I hope you’ll find valuable. One technical note: if you want help, you can email me directly or post under ‘submit questions/ask for help.’ It’ll help a great deal if you ask in a post, rather than as a reply or comment, because that ensures that I get an immediate email update and you’ll get an immediate response. Enjoy the weather, and the holiday weekend! Welcome, and Notice the Adjustments! You’ll start noticing some changes to this site over the next few days and weeks, until we shift over to the OpenLab, all in the hopes of making the site a little more useful for you and hopefully a little clearer for those of you who’ve felt it was a bit ‘bloggy.’ And hopefully this site will also become a model for what you might do on your own. 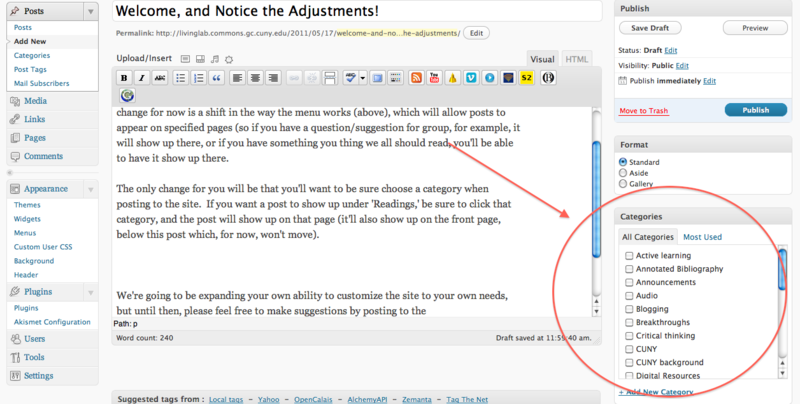 The main change for now is a shift in the way the menu works (above), which will allow posts to appear on specified pages (so if you have a question/suggestion for group, for example, it will show up on the questions/suggestions page, or if you have something you thing we all should read, you’ll be able to have it show up under ‘readings). For you, the only difference when posting will be that you’ll want to be sure choose a category when posting to the site. If you want a post to show up under ‘Readings,’ be sure to click that category, and the post will show up on that page (it’ll also show up on the front page, below this post which, for now, won’t move). We’re going to be expanding your own ability to customize the site to your own needs, but until then, please feel free to make suggestions by posting to the ‘questions/suggestions/discussion’ page or by emailing Scott directly. That goes for anything you’d like to see on the site, including categories you’d like us to add (for now you can add categories, but they will not show up on the menu unless you let me know. In future you should be able to add them yourself). Also, be sure to subscribe to the site via email (on the right bar of the home page), so you get a notification when anyone posts anything, and you won’t miss out! As we gear up for the first of our summer workshops, it might be good to have a place where we might gather questions you’d like us to be sure we get to (anything from ‘how do I change the name of a site?’ to ‘can the site do X?’). Feel free to email Scott directly or add them as comments to this post, and we’ll be sure to deal with them. Hope you’re all well! I love reading policy reports and position papers. Think what you like, I just do. I’d like to pass along two recent reports from the Pew Charitable Trust, one of my favorite think tanks. The first report “paint(s) a rich and complex picture of the role that digital technology plays in people’s social worlds.” But the big surprise is that social media sites (SMS) are playing an increasing role in the lives of older people (e.g. in my life what I’m doing right now) and a decreasing role in the lives of 18-22 year-olds. The second report responds to the question being bantered around a lot these days: “Is College Worth It? College Presidents, Public Assess Value, Quality and Mission of Higher Education.” One of my colleagues mentioned that the question should be: “What is college worth?” To society? To the workforce? Someone better do the numbers. A majority of college presidents believe that students are less prepared than they were 10 years ago. And the NYC Report Card tells us that the first noticeable improvement in reading and math scores appears in this year’s fourth graders. So we can expect at least another eight years of more of the same or worse. Post here if you have a question of any sort that you’d like us to answer, from the more philosophical to the basic and technical (“where is the button for…”). Remember to add your question as a post, rather than as a comment, to ensure that the rest of the group (who should be subscribed to the site) sees it and can help! 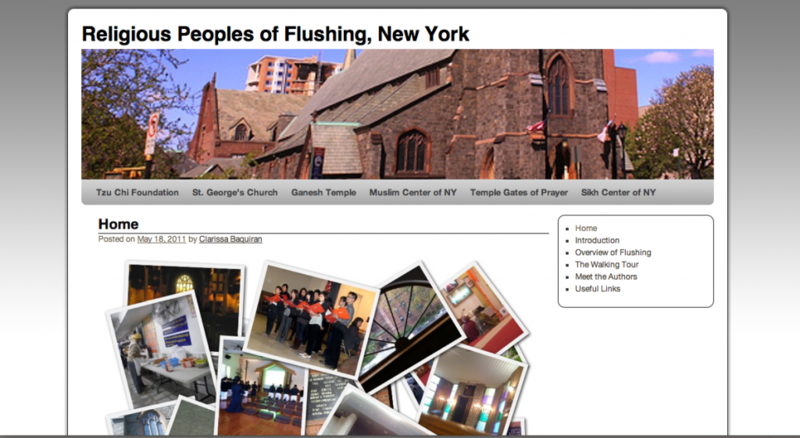 Here’s a nice tutorial on BuddyPress Docs, which won’t mean much yet, but will when the OpenLab arrives. Mark recently posted an article from the New York Times on using Twitter in the classroom. I’ve been interested in using Twitter in the classroom, particularly to offer that backchannel experience. Students would be able to comment electronically during a presentation, lecture, or other students’ comments. Is that a good thing? It certainly challenges the tweeter with the double-duty of listening while also composing a 140-character statement, question, etc. I’m not a naysayer, but I know that when I tweet at a conference, I say something smart to others in the twitterverse while sometimes missing the next point the speaker is making. Something to think about. What if the next time you teach something, you ask students to submit a question they have, along with a hashtag that everyone agrees on. You could look at all questions generated using your classroom’s computer and projector and a program such as TweetDeck, and address them immediately. Or what if you asked a question and asked everyone in class to respond, along with that hashtag? Or you ask groups to report back in a series of, say, three tweets. It’s exciting to think about those possibilities. Or you ask students to tweet while they read for the next class–notes they can instantly share with the rest of the class. What if you’re not in a computer room? You can ask students to use their smartphones. What if they don’t have smartphones? They can send their tweets via SMS using an ordinary cell phone (texting rates would apply). What if only a few students have such capabilities? Organize groups around the technologies available. Obviously a service like Twitter can serve many functions in a course, but it’s not going to take the place of an exam or an essay as a means of evaluation. It’s exciting to think, though, about its many uses. Aside from the writing that students will do using Twitter–and again, it’s not much writing at a time, only 140 characters–and the revising and editing that might go into shrinking a tweet to 140 characters, students using a service like Twitter will have to negotiate online personae, interactions with classmates in a virtual space, and the newly created community that can result. If you’re interested in experimenting with using Twitter in your course for the fall, I’d love to collaborate–perhaps we can start a series of posts here on the blog with the tag #TwitterTeaching so we can keep track of the ideas generated. Question for OpenLab folks: Will the OpenLab have a Twitter-type function that we should plan on experimenting with, or should we use Twitter itself in developing these projects? If it has been a few hours since you’ve thought about General Education, then you are in luck. For, in this brief blog entry, I’ve assembled a short reading list to bolster your appreciation for popular culture’s understanding of general education. Magazine media has been bombarding me with education pieces. And so I wanted to share some of what The Atlantic, New York, and the NY Times have to say about subjects that are close to the seminar’s goals and close to our professions. The Atlantic, June 2011. “Scenes From the Class Struggle,” by Joel Klein. In this article by the ex-chancellor of NY public schools, readers get their hair blown back by the animus against teachers unions, which Klein thinks are the primary reason that students are failing in NYC. I can imagine that The Atlantic’s mailbox will overflow in responses. Two observations: Klein needs to take my composition 1 class so that he can realize the power of research and the need to demonstrate claims rather than simply asserting them. Second, he equates testing with education—as if content, critical skills, and ethics somehow don’t matter. New York, May 9, 2011. “The University Has No Clothes,” by Daniel B. Smith. This article discusses two venture capitalists who are against higher education…even though one poor slob went to Cornell and Carnegie Mellon, and the other poor slob went to Stanford and Stanford Law. New York, May 16, 2011. “Paper Tigers,” by Wesley Yang. Trying to stop reading this essay is like trying to avert your eyes from a car crash. Messy but compelling. One of the subtexts of this essay is that general education subjects like social and cultural navigation skills have real-world consequences. The New York Times gives a daily feed of education stories that are useful or frightening or both. Loads of CUNY news combined with stories about how wealthy parents are sending their 3 year-olds to Kumon and then finding that these cherubs (their cherubs) are now worthy of their respect. But I saved the best for last. My favorite writer on education may strike some of you as old-fashioned, but I stand by him. His writing on the meanings and uses of college are still fresh even though he wrote his classic a few years ago. This writer told graduating college students that one must not simply memorize facts and ideas. Instead, one must use these ideas for improving society. In fact, he said that education was meant to be shared because it harnesses students to society and even to nature. For this writer, thinking is a social act that fuses books to minds to people outside of scholarly communities. This writer wrote during a time of tumult and change: technology and commerce were outpacing the humanities, and he wanted to fuse these too often disparate subjects. For indeed, today, teachers and college students are not outside of technology and commerce. This writer believes that the college graduate should be fully enmeshed in life—body and soul—and should not avoid difficult work, no matter if the work is physical or mental or both. Ralph Waldo Emerson wrote “The American Scholar” in 1837. When I think of General Education, I think of Emerson’s call to action. This post is a shout-out to Steve Hinds, a very smart guy who is embroiled in the hard work of trying to figure out how to make developmental math programs work at CUNY. He’s doing great work which is not as widely-known as it should be. Here are two of his papers detailing his work over the last years: More Than Rules and More Than Reshuffling. He doesn’t use the phrase “Gen Ed” but he’s designing curriculum that accomplishes so much of what we’ve been discussing this year. For anyone who is teaching at CUNY, his discussion of the process, hurdles, and so on will give you food for thought. For those teaching math at the remedial level or above I highly recommend the appendices with some sample lessons. I will tack on a link to a post on the EdVox blog from last November by John Garvey on teaching at CUNY, which features a quote from Steve but is worth reading in its own right. Finally, this should perhaps have been included as a reply to the post Developmental courses and the First-Year Experience but I wasn’t sure how to embed documents in a reply. Thanks to everyone who came out for our presentation at the 7th Annual General Education Conference: Journeying through General Education. I wasn’t able to make it out to Nick’s for pizza afterwards for CUNY Pie, but I’ve heard that the pizza was good and that the crew even had a full share of vegetables on it. 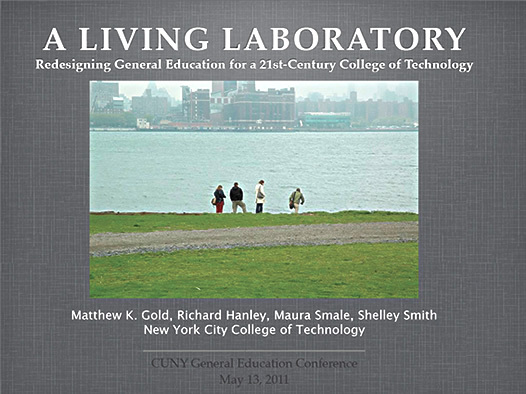 At the conference itself, four members of our steering committee — Matthew Gold, Richard Hanley, Maura Smale, and Shelley Smith — presented on “A Living Laboratory: Redesigning General Education for a 21st-Century College of Technology.” Below, please find our slides in PDF form. I know that other faculty fellows presented at the conference, and I’ve heard great things about all of those presentations. Please consider posting your slides! Here’s an interesting article on using Twitter in all types of classrooms. 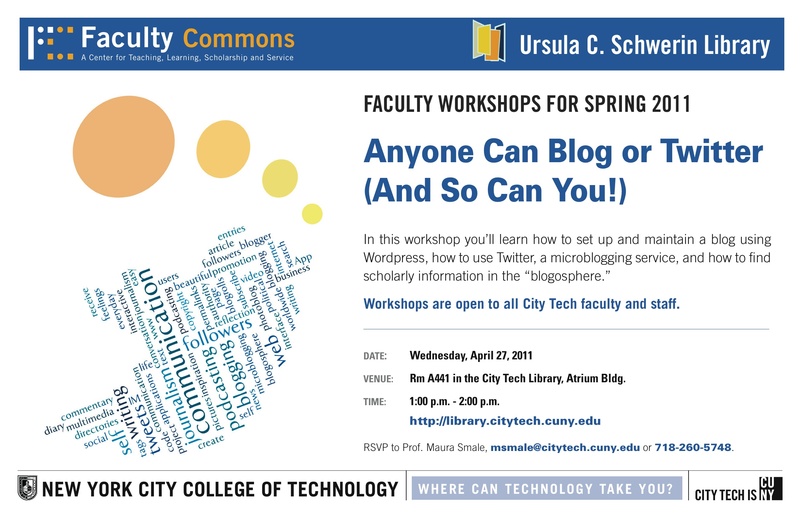 Library’s Faculty Workshop: Anyone Can Blog or Twitter! How can we use the open digital platform? This course site for Prof. Tom Harbison’s history course features course details and schedule, assignments, supports (e.g. lecture slides), and student blog postings. All students in this course are members of the blog. Another possibility is to ask students to create their own blogs, and use RSS feeds to pull their posts into the main course site. This course site for Prof. Joe Ugoretz’s course has many of the same features as the history course above, but adds in private forums (students must be logged in to post/view) and some grading support behind the scenes. A space for faculty across the college to talk about best practices for teaching in many disciplines. A great way to reach out to alumni. Park your car in Harvard Yard [Pronounce each \å\ as in father if you do not rhyme father with bother. Drop the \r\ if it is in the same syllable as a vowel.]. Surf the site. Download the Report of the Taskforce. Read some of the digital essays on General Ed. Look at some of the trailers under Courses. If you like what’s happening at one of the Ivies, then “generally” use their précis. Don’t sweat the big stuff.